In our house you will find: Central heating, flat screen TV in the living room, The kitchen equipment has a dishwasher, oven with ceramic hob, Senseo coffee machine, electric. Bread slicer, fridge freezer and washing machine, 1 double bedroom, 1 sofa bed, and the living and sleeping area with rustic wooden floors. Welcome to the highest commune Duke Reuth district Bamberg, at the gateway to Franconian Switzerland! Looking culture and a variety of leisure activities, recreation, relaxation, want to let your soul? Then it will most certainly like in our house Herzog Reuth! The historic house was built at about 1810. It has a 93qm large living space spread over two floors. The house is idyllically situated in the highest town of the district of Bamberg. After a substantial refurbishment in 1994 was completely renovated in 2015 and offers a pleasant living environment. 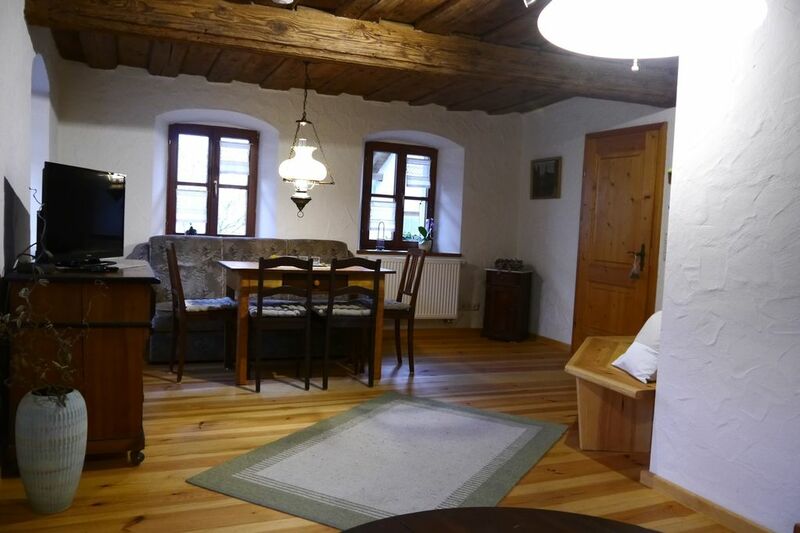 The house is the starting point for various recreational activities (hiking, climbing or cycling) in the district of Bamberg and the Franconian Switzerland. A parking space in front of the house. We are looking forward to your visit! Our apartment is the ideal starting point for city travelers, hikers, mountain bikers and climbers. Visit the world heritage city of Bamberg with its interesting sights (Bamberger Reiter, Old Court, new residence, etc.) Let influence their meaning through the colorful spectacle of nature in autumn. To unwind, a visit to the Thermal Baths in Bad Staffelstein or Obernsees worth. The Christmas time is framed by Christmas markets and the Bamberger crib way, as well as the largest advent calendar at the town hall in Forchheim. In winter for cross-country skiers a variety of trails in the Franconian winter landscape, but also sledders get their money. At Easter, there are countless ornate decorated Easter fountains, as well as Easter markets in Franconian Switzerland. Numerous hiking trails, mountain bike trails, as well as rocks with different levels of difficulty are available in our district Bamberg and Franconian Switzerland. The hosts will spoil you with Franconian specialties and beer from local breweries. We are happy to give you more tips to spend a pleasant holiday with us in beautiful Franconia.